It sounds strange now but - at the time - this was a really big deal. 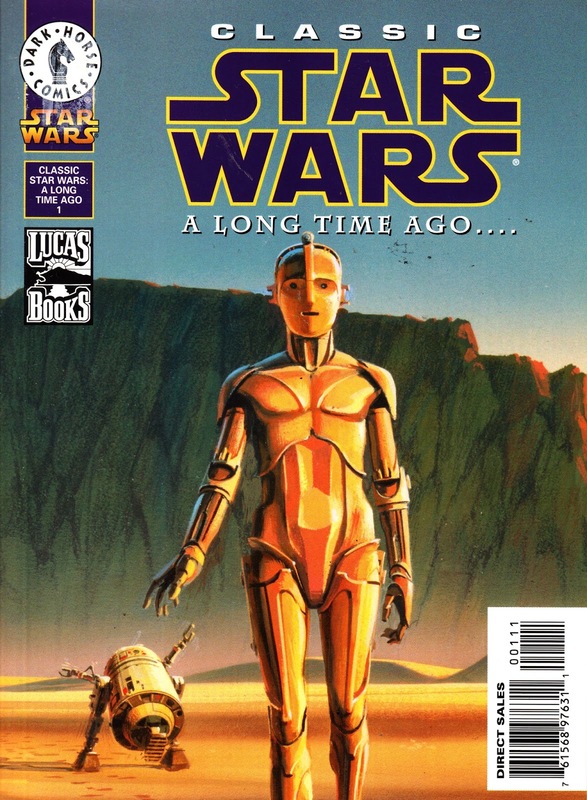 It was the first time that pretty much any of the 1977-85 Marvel Star Wars run had been reprinted. Despite the boom in Star Wars publishing pretty much throughout the 1990s, no one had tackled the inventory of Marvel material (107 regular issues, one mini-series, three annuals and two Star Comics series). And the price of back issues (never exactly in plentiful supply in he UK thanks to a long-standing embargo on copies shipped to UK newsagents) had shot up as collectors returned to the saga. However, Dark Horse didn't exactly jump at the opportunity. These digests shrunk the artwork (making text tough to read) and reproduced it in b&w. And they cherry-picked the reprints so collectors weren't getting a complete chronological run. Even the selection of cover art hardly sold the product inside. 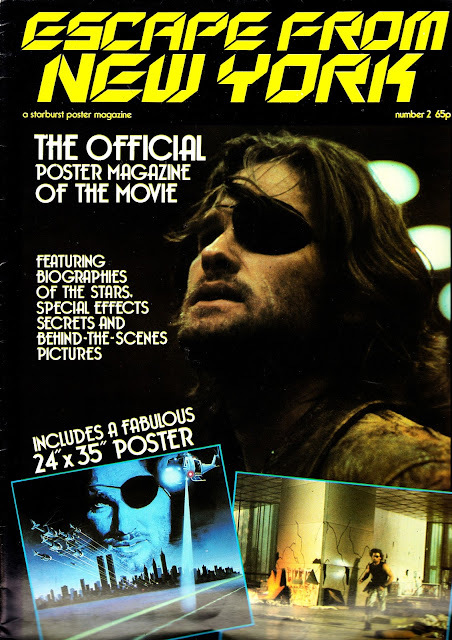 Nevertheless, this run of six 96-page editions (sometimes described as trade paperbacks online although they are actually digests) were essential purchases at the time. Only to be superseded by a run of (really expensive) Dark Horse trade paperbacks. Which were then replaced by Omnibus editions. More recently, with the license back at Marvel, the original run has been collected into several whopping volumes... with prices to match. From 1983: FANTASY EMPIRE COLLECTOR'S EDITION issue 1. 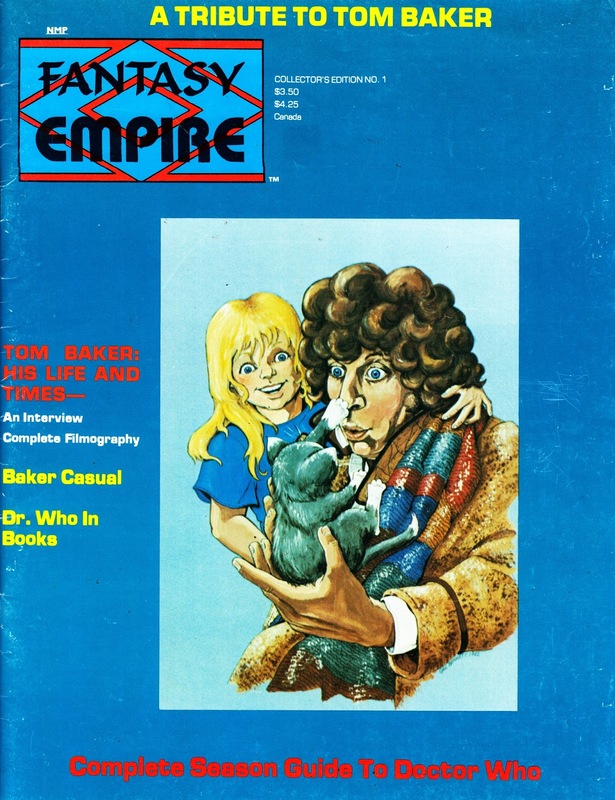 Fantasy Empire, which ran for 16 issues between 1981 and 1985, was a US fan magazine dedicated to British TV and pop culture... specifically DOCTOR WHO. In addition to the core run, the magazine also had several spin-off. This was the start of a six issue run (spanning 83-84) which reprinted material from the earliest issues of the regular mag. The cover art is - hmmm - interesting. And the strap line makes it sound like he died already. From the summer of 1980: COMIC MEDIA NEWS INTERNATIONAL bows out with its 40th and final issue. 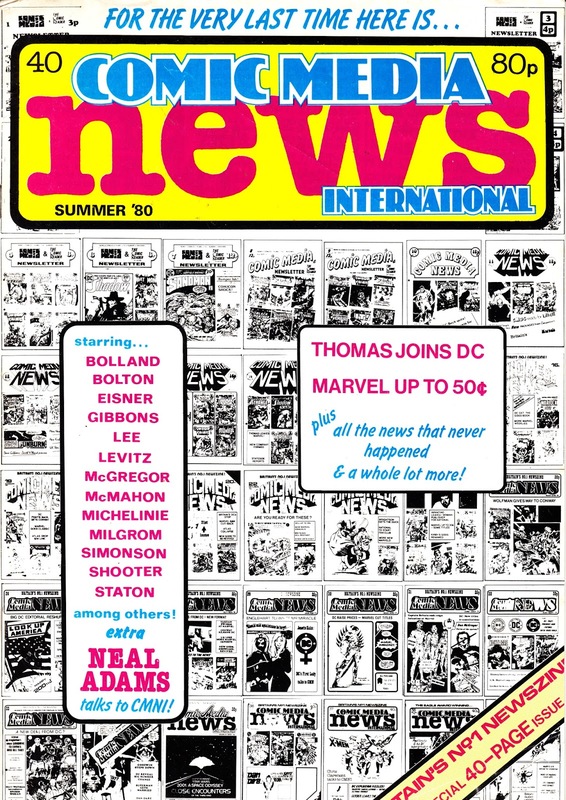 I love back issues of news-focused comics fanzines because of the instant nostalgia rush of reading about the latest contemporary projects from creators and publishers. With the power of hindsight we know some will amount to nothing (literally in some cases) whilst others - sometimes deemed worthy of no more than a sentence or two) would change the Star Age forever. CMNI, the foremost British newszine of the period, was shuttering because editor/ publisher Richard Burton had achieved the ultimate fanzine dream: using it as a way into the profession proper. He was joining Dez Skinn's new North London British Bullpen to be at the ground zero of the Marvel Revolution: the audacious and controversial plan to reboot Marvel UK to lure in more punters. After a stint at Kentish Town Road he moved south of the Thames (just) to take up Editorial residence in Tharg's Command Module. From March 2007: DREAMWATCH ISSUE 150, the last issue of the magazine and the end of a long publishing run that dates all the way back to the launch of DWB as a photocopied DOCTOR WHO newsletter in the early 1980s. Technically this is so far outside the pre-millennial Star Age that it is virtually last week's issue. But I thought it was important to include it because it does mark the end of such a significant run. The mag was supposed to have a bold future as an online site but - as is often the case - success in one medium doesn't ensure longevity in another and Titan Magazines (true to form) soon lost interest in that as well. From 1990: The premium ALIEN NATION: THE SPARTANS LIMITED COLLECTOR'S EDITION, published by Adventure Comics. As posted previously, Adventure snapped up the rights to the about-to-be-cancelled Ken Johnson TV series (based on the earlier film) in 1990 and published a run of black & white mini-series which dug deeper into the (near) future Earth established on the screen. This creative route seemed to be governed by a limited licence which - with one exception - didn't allow them to use the characters from the film or TV versions. From 1994: Carrying on the TRIPODS theme from BEEB (which ran a regular spin-off strip which was - frankly - a lot more exciting than the sluggish show itself)... the first TRIPODS VHS release, courtesy of BBC VIDEO. Ultimately buyer enthusiasm was somewhat mooted and the folks at BBC WOODLANDS (tucked under the shadow of the Westway) passed on releasing season two. At least until the height of the DVD era. 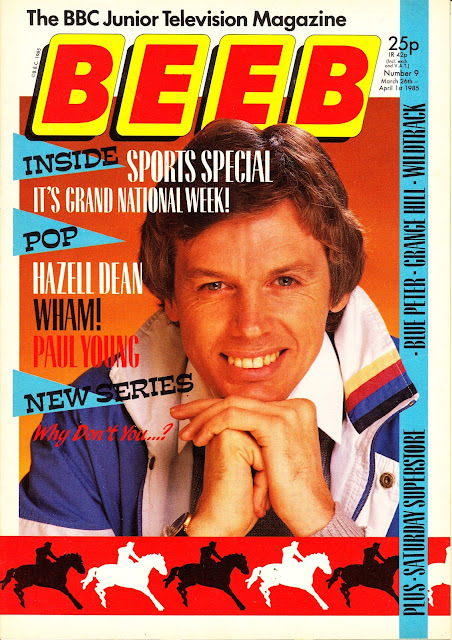 From April 1985: A bumper month of BEEB magazines, just as the TV schedules transition from the autumn/ winter season to the "that'll do" summer makeweights. The Star Age connection is, of course, Peter (Chief Scout) Duncan... who undertook the ultimate dare in FLASH GORDON. 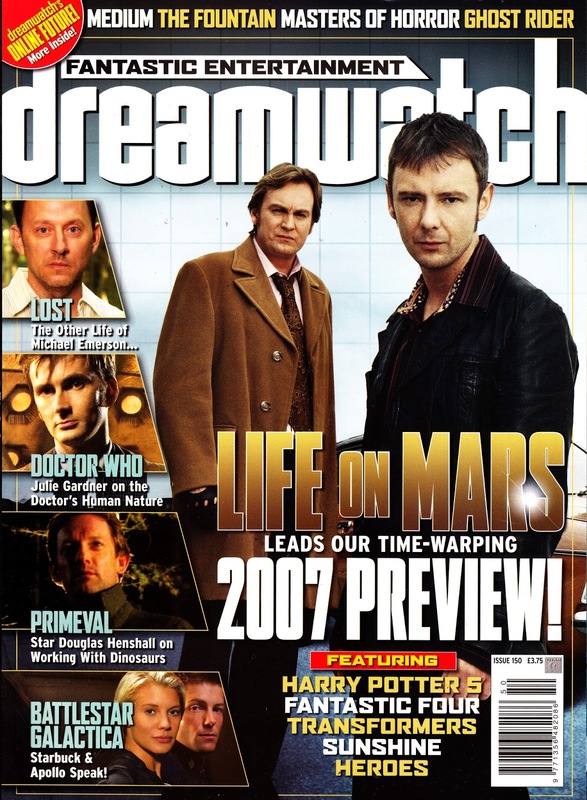 From January 2003: DREAMWATCH MAGAZINE celebrates its 100 issue (and an awful lot more if you count DWB as well). Technically this falls outside the Star Age and therefore outside the remit of STARLOGGED. But it's an anniversary of a mainstay (which managed another fifty issues before succumbing) so well worth a post. From February 1988: Marvel UK's much heralded ACTION FORCE weekly runs out of road after a mere fifty issues, one less than SPIDER-MAN AND ZOIDS mustered... and considerably less than the three year run in IPC's BATTLE ACTION FORCE. The cancellation came as so drying of a shock at the time. It felt like the British Bullpen had a surefire winner. THE TRANSFORMERS had been selling well for several years and it seemed a sure bet that this fellow Hasbro property would fair equally well. 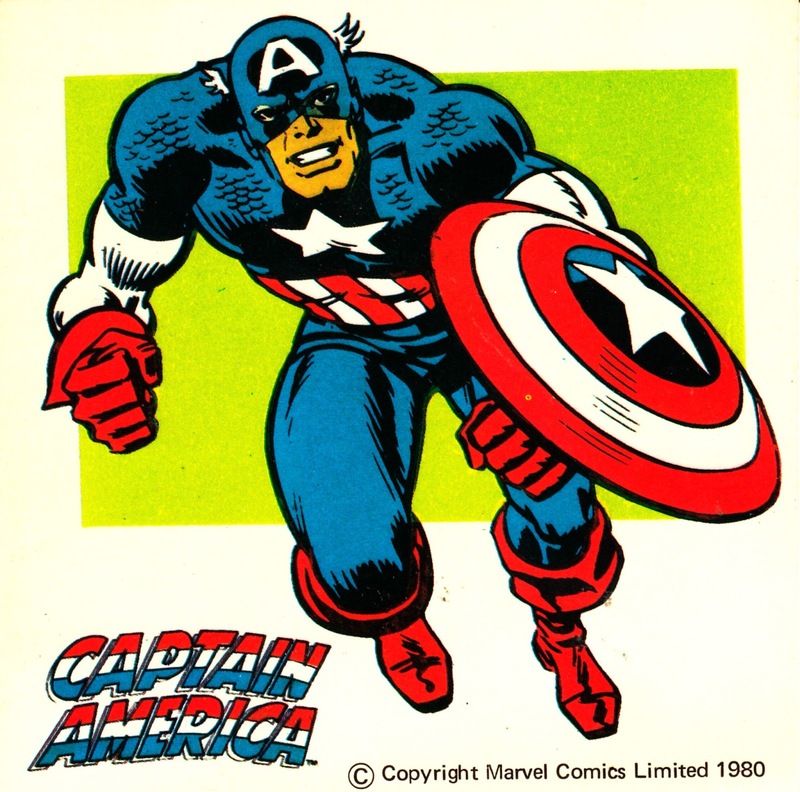 Hasbro had taken over the toy franchise, from Palitoy, a year or so earlier and reinvigorated it with more ambitious packaging designs, punchy TV advertising (using Marvel animation) and a multimedia merchandising roll out (modeled on G.I. JOE) which included, for the first time, episodes of the Joe animated series (redubbed, but not reanimated, and with a new title sequence to remove the most obvious Joe references) albeit only on VHS because they couldn't score a broadcast deal. 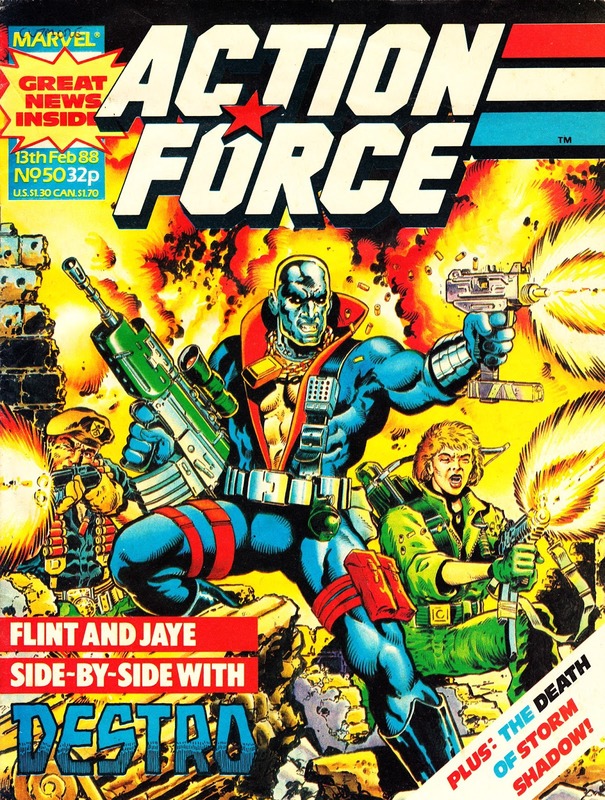 Marvel's package was also pretty attractive: a full colour 24 page weekly on decent paper (none of the surplus newsprint dumped on the IPC weeklies from Reed International's paper mills) which combined new UK material (focused to plug whichever toy Hasbro were desperate to shift at retail) and reworked GIJ strips, seen in the UK for the first time. Despite the setback, AF continued to be part of the British Marvel arsenal. 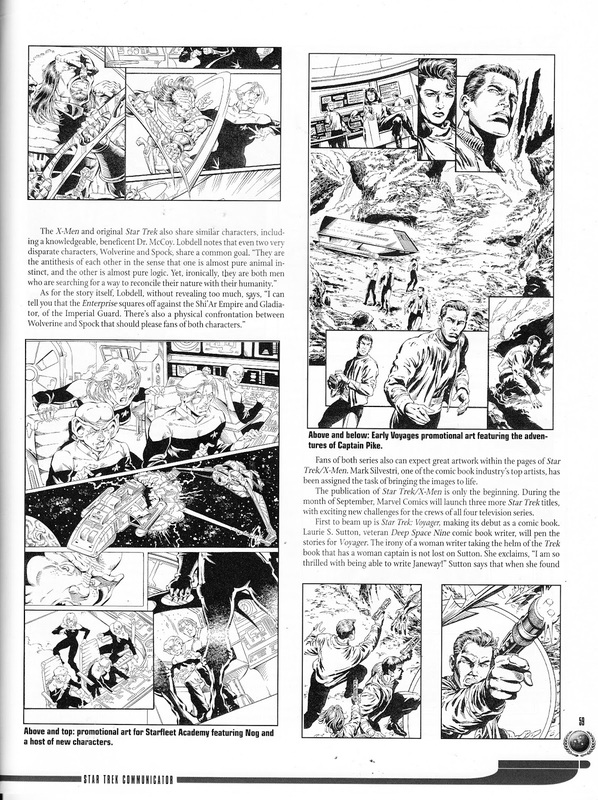 The US reprints transferred to THE TRANSFORMERS and the UK strips moved into a monthly, also sold in the States as G.I. JOE EUROPEAN MISSIONS, which clocked up 15 issues. 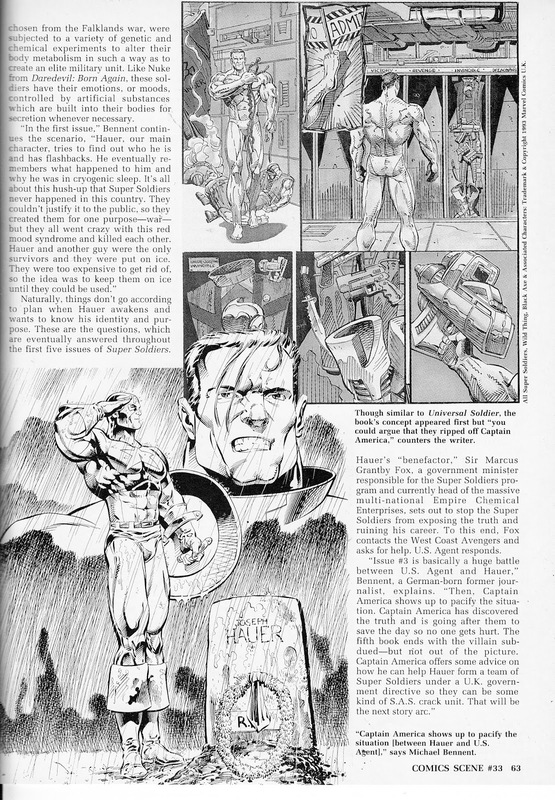 US reprints also appeared in THE INCREDIBLE HULK PRESENTS in late 1989. Marvel also published several annuals and specials. 1989 also saw the toys rebadged as G.I. JOE: THE ACTION FORCE to bring them in line with international marketing efforts. From 1998: the sleeve for the UK VHS release of the teleflick BABYLON FIVE: IN THE BEGINNING, signed by several members of the cast and crew. To be honest, I'm not 100% sure who signed this. One of the signatures is clearly Mira Furlan but I'm really not sure about the other. I am pretty sure that the signing took place at London's Forbidden Planet (during the New Oxford Street era) to promote the release of the tape. JMS and the B5 crew were popping up in the UK all the time and I seem to recall going to several different signings over several years. The TV Movie was the first of four produced by US cable outfit TNT (another part of the Warner empire) which rescued the show from oblivion at the end of season four. B5 had started as a one hour syndicated drama in the grand tradition of STAR TREK: THE NEXT GENERATION. But WB TV had found slots on local stations harder and harder to come by as the amount of programming increased and upstart networks the WB and UPN signed-up local affiliates. TNT stepped in with a deal to bankroll (on a reduced budget) a final season (completing the much discussed five year plan), four TV films and rerun the existing four seasons. 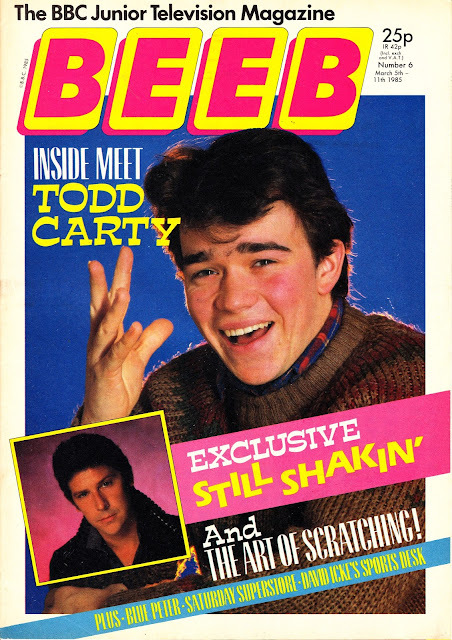 There initial enthusiasm dulled considerably when it came to the troubled spin-off CRUSADE (which suffered the indignity of being cancelled before a single episode had aired). Of the four movies, IN THE BEGINNING is the best of the bunch. 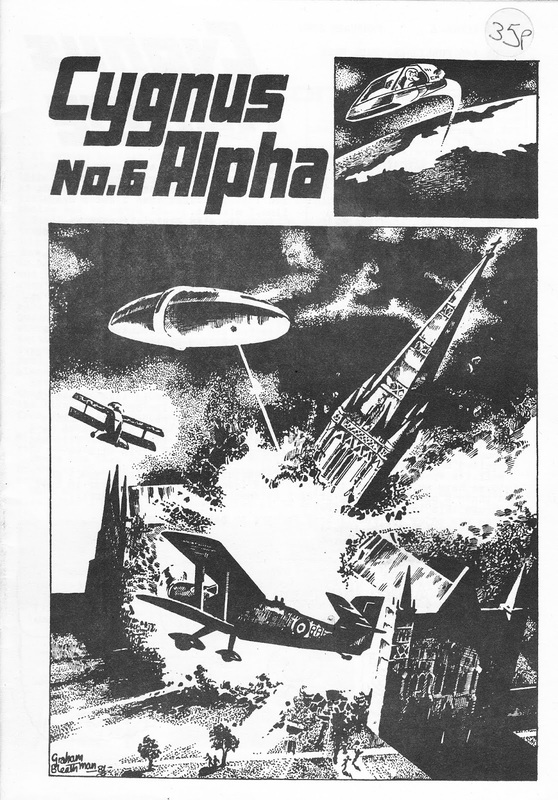 From February 1982: a random issue of A5 British media fanzine CYGNUS ALPHA which somehow, at some time, snuck into my collection. Its actually a jolly good little read with a stunning cover. From April 1992: the 4th issue of the unofficial UK STAR WARS FAN CLUB magazine. 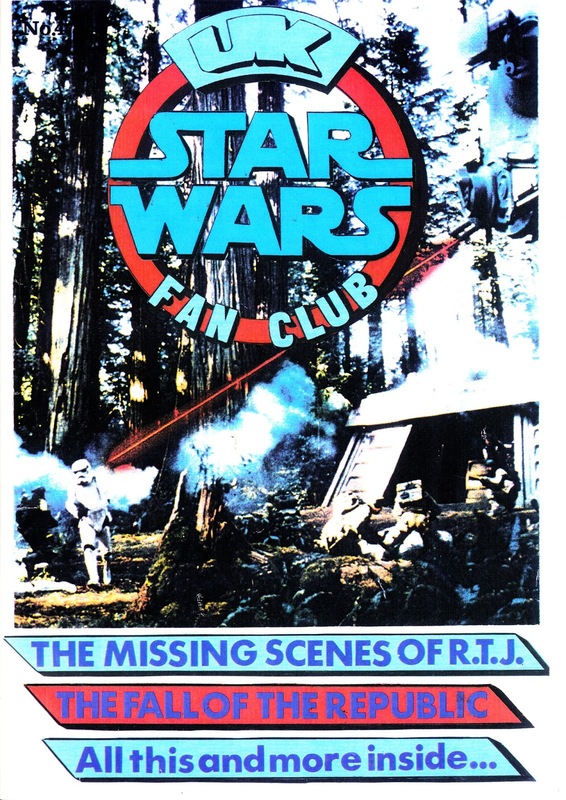 The highlight herein was the analysis of the lost scenes and sequences from RETURN OF THE JEDI. In that pre-internet age (and other the Saga's extended hibernation) this sort of journalistic detective work was something of a revelation. 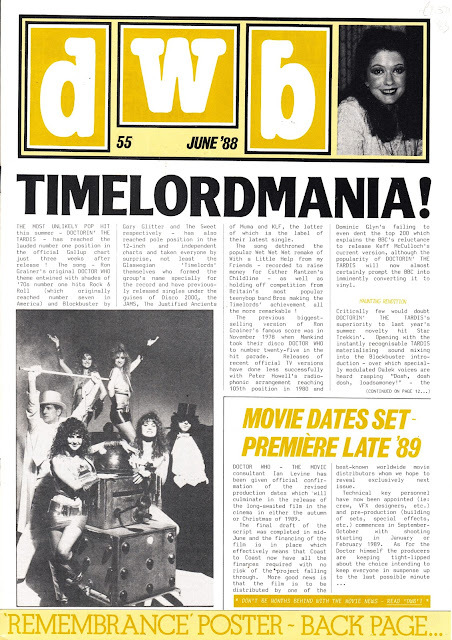 From July 1988: DWB issue 56 with a front page article that doesn't seem to have generated much traction in DOCTIR WHO history and lore. It's interesting that even DWB were forced to pay JNT a backhanded compliment by acknowledging all the other aspects of his role on top of actually producing the show. Today, there would be an army of professionale to cover those ancillary functions. 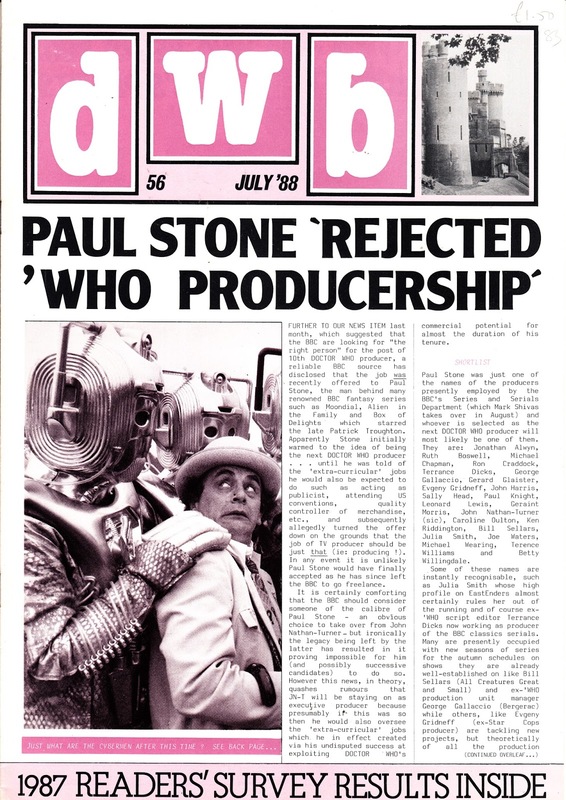 Its also interesting that DWB didn't go inorganic mode at the prospect, however slim, of s producer from the Children's department taking on the show (which, of course, sat within the BBC's Drama empire). As it turned out, JNT would indeed stick around for another season. 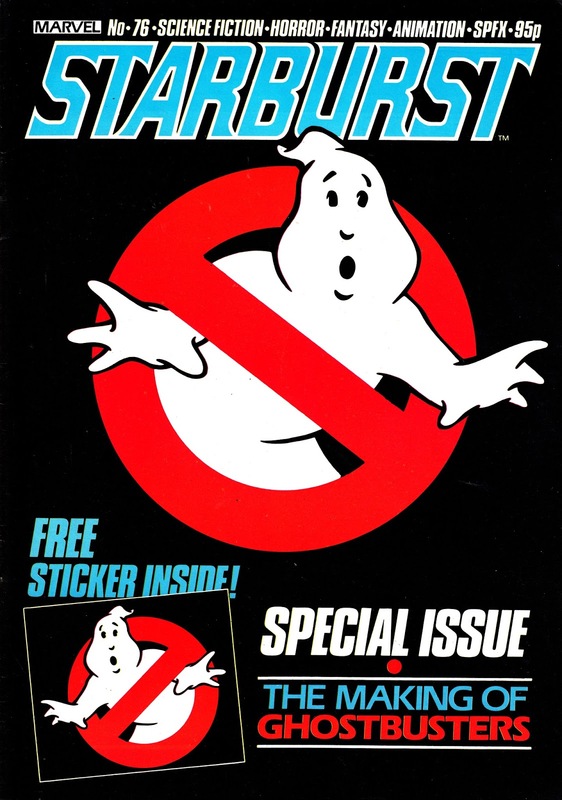 From December 1984: STARBURST, from Marvel UK, covers the making of the original GHOSTBUSTERS movie in a special issue of the title's regular run. Marvel even threw in (literally, it was loosely inserted in the magazine and easily lost) a free GB logo sticker (did they get a license for that?). I saw the new GB movie at the weekend and I have to say I thought it was jolly good. It certainly surpassed my expectations. Even if, I times, I thought I was watching history's most expensive FRENCH AND SAUNDERS sketch. Forget about the hopeless trailer (which made it look like a beat-for-beat rehash of the first flick) and go with an open mind. I'm pretty confident you will enjoy it. There is already talk of the inevitable sequel. I hope it's better than the original sequel. This issue inadvertently started a long and prosperous relationship between the British Bullpen and the franchise. THE REAL GHOSTBUSTERS animated series became a cash machine for the Annex Of Ideas, spreading out from their own title to numerous annuals, specials, spin-offs, a SLIMER solo title, a strip in comedy horror weekly IT'S WICKED and a residency in the anthology MARVEL BUMPER COMIC. 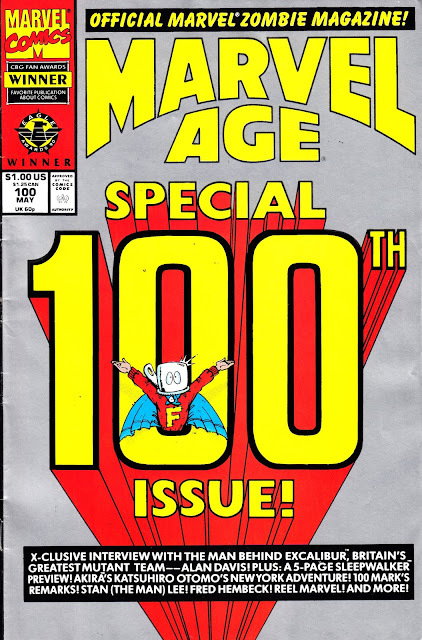 From May 1991: MARVEL AGE MAGAZINE, the in-house fanzine for Marvel's wares, celebrates its 100th regular issue with this silver ink cover. 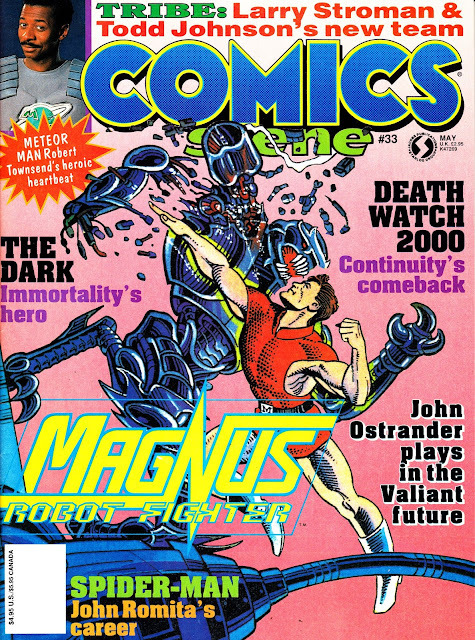 Despite being officially designated a magazine, it always appeared in a comic book format and in standard comic book dimensions. A 100 issue run is it itself pretty impressive but MA eventually mustered 140 regular issues (it succumbed to the imploding market in September 1994) as well as sundry annuals and preview specials as well as several magazine one-shots. From September 1997: the first issue of the A5 British comics zine INTER-SECTION. I found this, and the second issue, in a comic shop quite recently. 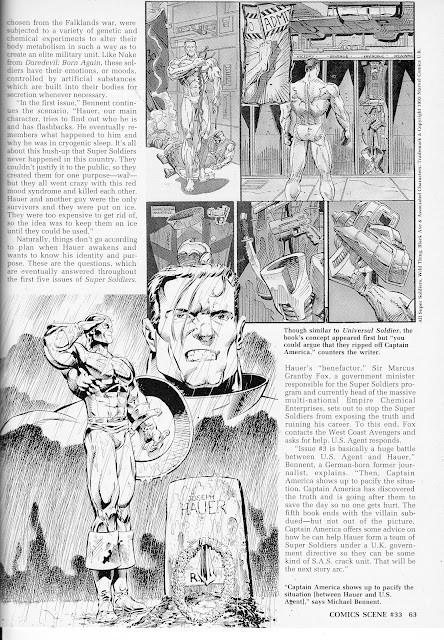 From May 1993: COMICS SCENE issue 33 previews MARVEL UK's SUPER SOLDIERS, one of the burgeoning number of UKverse books to hit in the booming months of early '93. The book eventually ran for eight issues before being cancelled suddenly in the Genesis Massacre (the sudden decision, in the face of plummeting sales across the industry, to withdraw the British Bullpen from the US market). 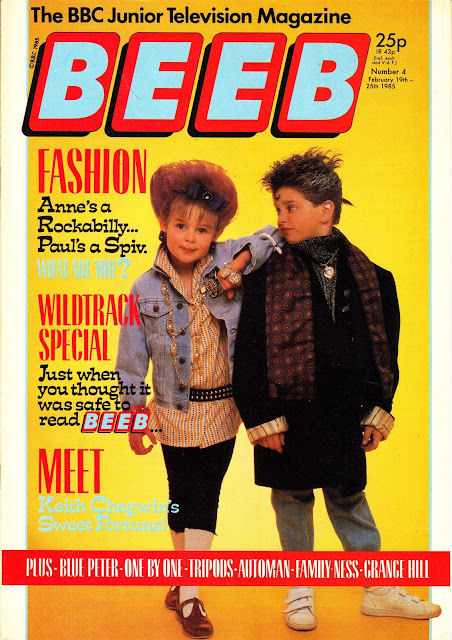 The first issue, enhanced with a silver foil cover, shifted more than 200,000 copies. Issues can still be found in retailer dump bins to this day. Issues 9 &10 were announced in the pages of MARVEL AGE MAGAZINE but never appeared. 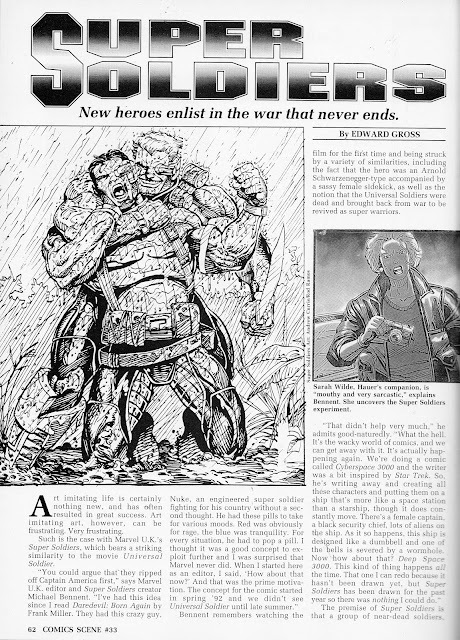 The eighth issue was the only part of the REDMIST 2020 crossover/ launch that actually made it into print. The other three books (DEATHDUTY, BLOOD RUSH and ROID RAGE) were all scrapped at the last possible moment. 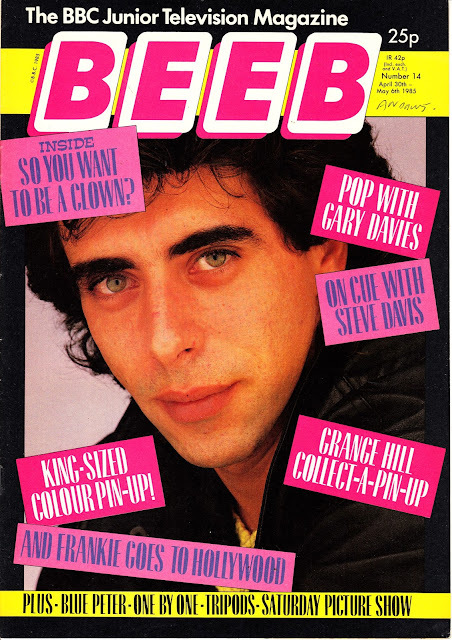 From 1985: the March cover dated issues of Polystyle's Look-In pretender BEEB. It's another motley crew of cover stars with Carty, Cheggers, a dog and the self-proclaimed Son of God (and ardent fan of 'V'). It's little wonder that the early circulation figures were somewhat - ahem - soft. 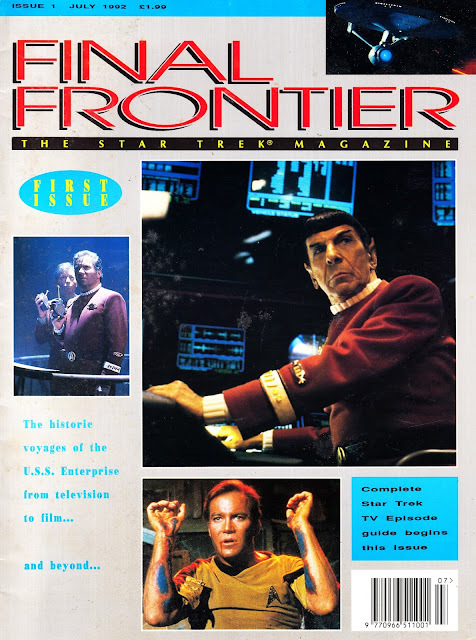 From July 1992: one of the most brazen examples of lawyer-baiting in the history of genre mags: Britain's knock-off STAR TREK magazine FINAL FRONTIER. This monthly started out murky... and got progressively more so as the months passed. 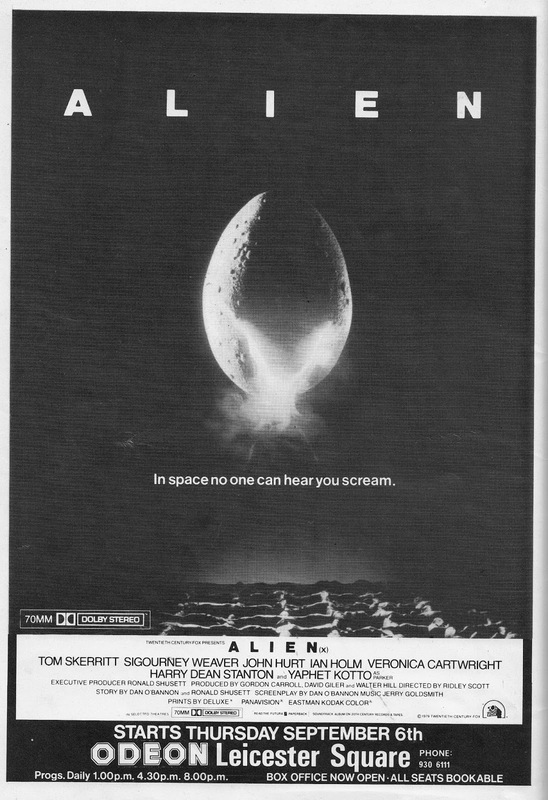 Its not really clear whether this was ever actually authorised and endorsed by Paramount. Later issues boldly proclaimed on the cover - in the spirit of teen idol fast cash mags - that it was "100% unofficial" but this and other early issues make no such jail-dodging claim. 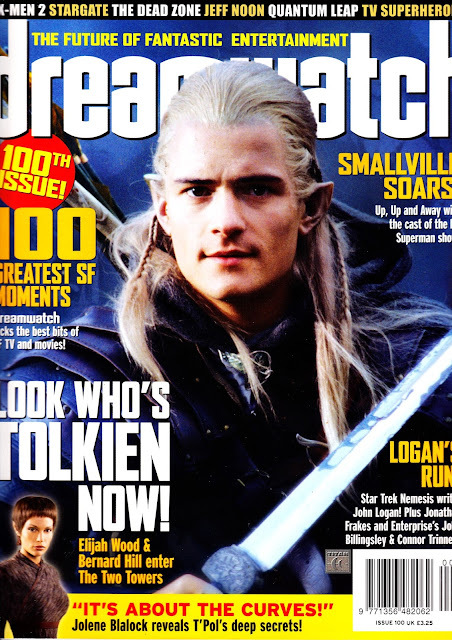 The publisher sidestepped any reluctance by Paramount to open the studio gates to this venture by licensing (one assumes this part of the operation was at least above board) Trek related articles from STARLOG magazine. 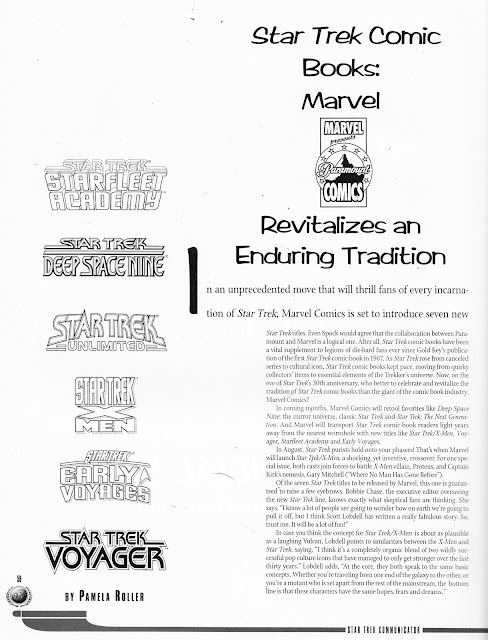 But not the officially licensed ones that Starlog Group also churned out at this time. I didn't buy this at the time because it looked so blatantly cheap and copies seldom surface with dealers and secondhand shops. But, at some point, the supply of Starlog articles ended (by my reckoning either the publisher got caught ripping Starlog off, stopped paying a licensing fee to Starlog or Paramount got wind of this ingenious workaround and leant on the US publisher to turn off the taps) and FF coasted on page after page of glossy stills and a minimum of text. It also continued to carry a lot of mail order advertising for Trek products sold by the publisher. I suspect this arrangement worked in the same way that the SPORT and SUNDAY SPORT newspapers did (and maybe still do) function as a vehicle for copious amounts of advertising for other adult services and products from the same company. A loss leader to generate other income. The publisher Trident did also have a brief punt at repackaging DC Classic Trek and TNG strips for the UK market. One assumes these were officially licensed (otherwise they'd run the risking incurring the collective wrath of a Hollywood studio AND a big multi-national publisher... backed by another big Hollywood studio) although the pages looked like they had been crudely reproduced from copies of the US originals rather than from anything higher quality. As the material was contemporary then this may have been down to cost and the terms of the deal rather than better masters being unavailable. 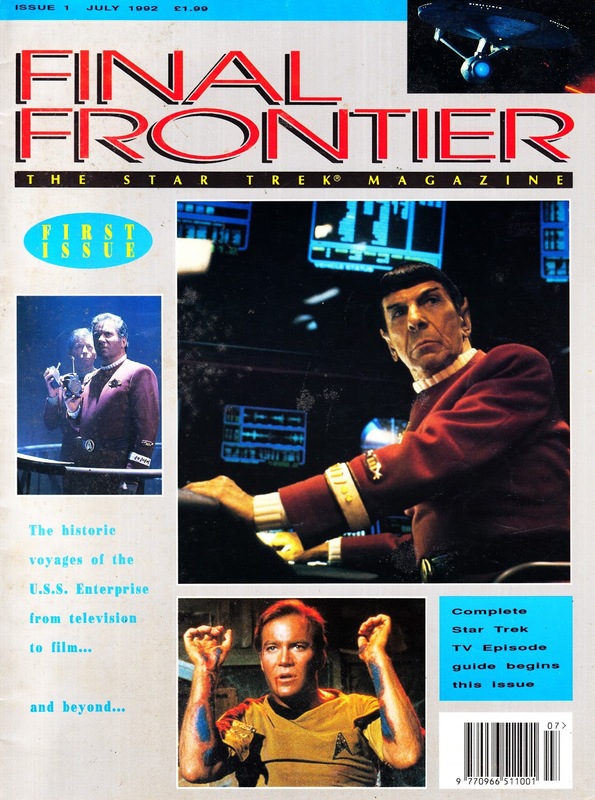 Despite FINAL FRONTIER being pretty shamefaced it did manage to muster a fairly lengthy run, at least 26 issues through to August 1994. Distribution tended to be patchy and copies were more likely to surface in independent newsagents rather than the big chains. It must have also paved the way for Titan's definitely official Trek magazine which launched in 1995. From 1981: the second STARBURST POSTER MAGAZINE, published by Marvel UK and this time an officially licensed tie-in with the John Carpenter classic ESCAPE FROM NEW YORK. These STARBURST spin-offs are a lot harder to track down then issues of the regular magazine but, from separate sources, I've recently been able to get hold of copies of each of them. 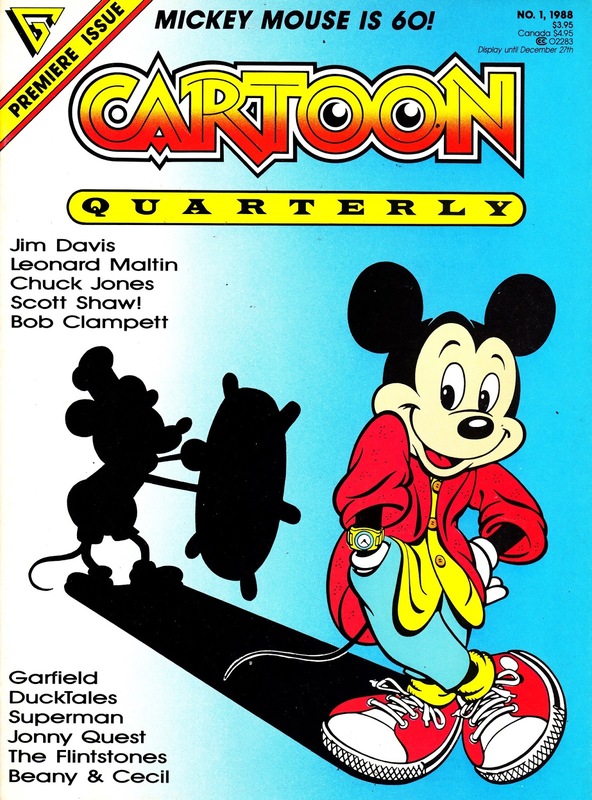 From the winter of 1988: the first issue of the animation magazine CARTOON QUARTERLY, published by Gladstone who also held the US license to publish Disney's comics (aimed to a large extent to dedicated Disney collectors) during this period (although the magazine casts its net further than the Mouse House). Despite the optimistic title, this does not appear to have e encounter made it to the second quarter: cancelled after this first and only issue. From 1986: the second issue of 2000AD's DICEMAN, Tharg's short-lived venture into the world(s) of Choose Your Own Adventure books and Role Playing Games. This issue actually gets around to including the eponymous hero, created by Pat Mills and Graham Manley. Rick Fortune is a 1930s Private Detective with psionic powers. Slaine (Mills and Williams) and the ABC Warriors (Mills and Dillon) also appear. 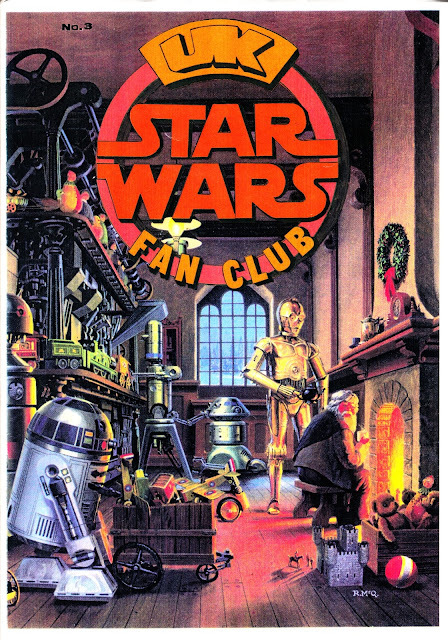 From the end of 1991: The third issue of the UK STAR WARS FAN CLUB MAGAZINE (unofficial of course) celebrates the festive season (so ideal fodder for a mid-July post) with a cover that repurposed art originally created for a Luasfilm corporate Christmas card. From August/ September 1996: STAR TREK COMMUNICATOR magazine, published by THE OFFICIAL STAR TREK FAN CLUB, previews the launch of the new line of STAR TREK comics published under the Marvel/ Paramount imprint. 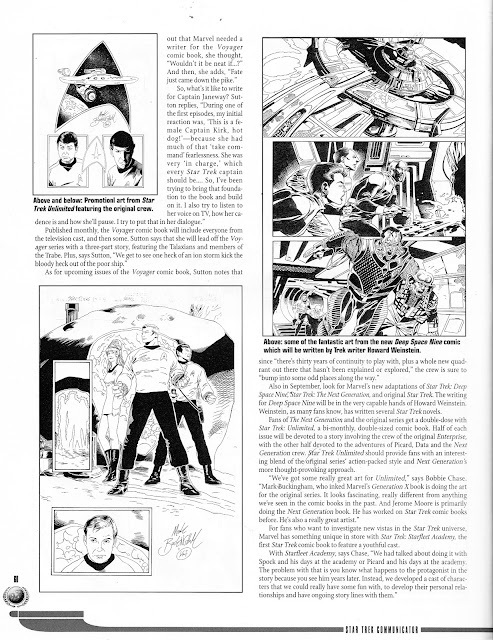 Although Trek has been a mainstay of comic books since the era of the original TV show (or earlier in the case of the UK, thanks to the JOE 90 weekly getting a head start on the BBC) I've never felt there's a particularly large section of Trek fans that would also dip into the comic adventures of Kirk and crew. Clearly enough to sustain two regular books and the occasional special, annual and limited series but a whole imprint? 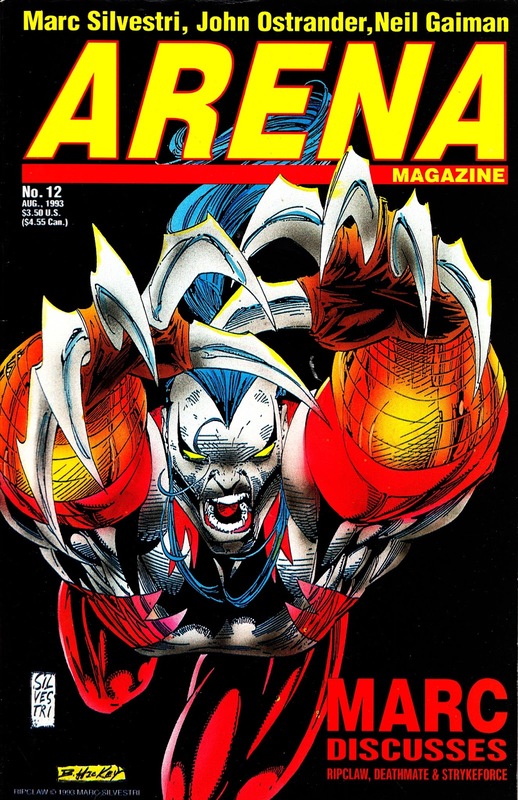 Marvel, in typical Nineties excess, snatched away the contract (thanks to their swoop on Malibu Comics) with the promise of a myriad of ongoing series based in some pretty obscure facets of the franchise. A saturated market, too few readers, a big licensing bill, nose diving sales across the industry and Marvel's own perilous financial status conspired to make this the boom before the bust... but there was some good stuff published over the following two years. From January and February 1985: the first five issues of the ill-fated BBC kids weekly BEEB. 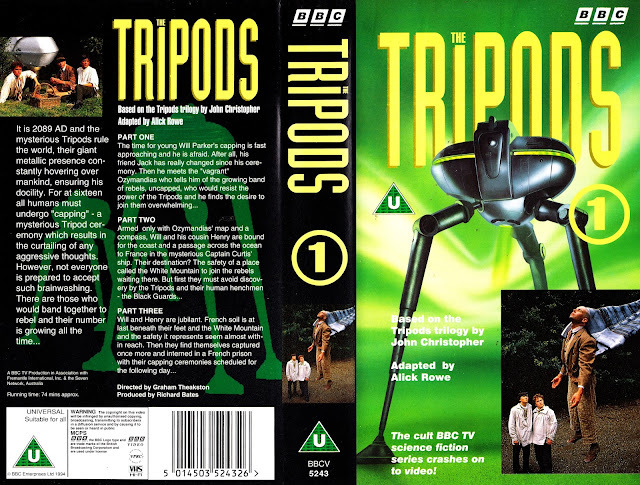 This was a belated pretender to the LOOK-IN crown: a me-too title that attempted to leverage the might of the BBC schedules to create a viable rival. It didn't quite go to plan. 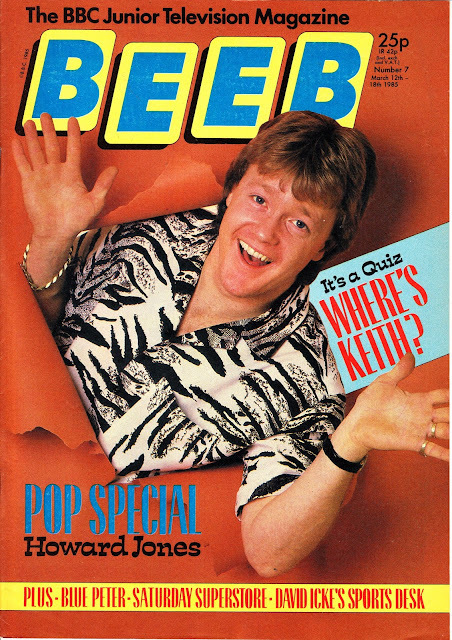 Unlike LOOK-IN, published by ITV Publications and a spin-off from TV TIMES, Beeb didn't have the advantage of being inside the BBC tent or the muscle of a best-selling listings magazine to back it up. It was a licensing deal between BBC Enterprises and Polystyle, the struggling erstwhile publishers of TV COMIC and COUNTDOWN. Beeb tried to be all things to all readers and managed to miss the mark. It felt curiously old-fashioned and lacked the sense of dynamism of its rival. The range of covers in the first month demonstrate this: a dull mix of BLUE PETER dressing up games (of the sort that could only excite Biddy Baxter and the BBC Goveners) and layouts reminiscent of teen girl mags. Hardly something to get young boys buying. The adventure strips were covered off with adaptations of Glen Larson's AUTOMAN (a short-lived show that had more impact on the BBC ONE schedules than it did in the States) and THE TRIPODS (a more dynamic take on the plodding TV show, apparently from the pen of Pat Mills). DOCTOR WHO was off limits because of the Marvel deal and its tenuous future in the minds of BBC management. Drippy zoo vet drama ONE BY ONE offered neutral territory for boys and girls underwhelmed by action. 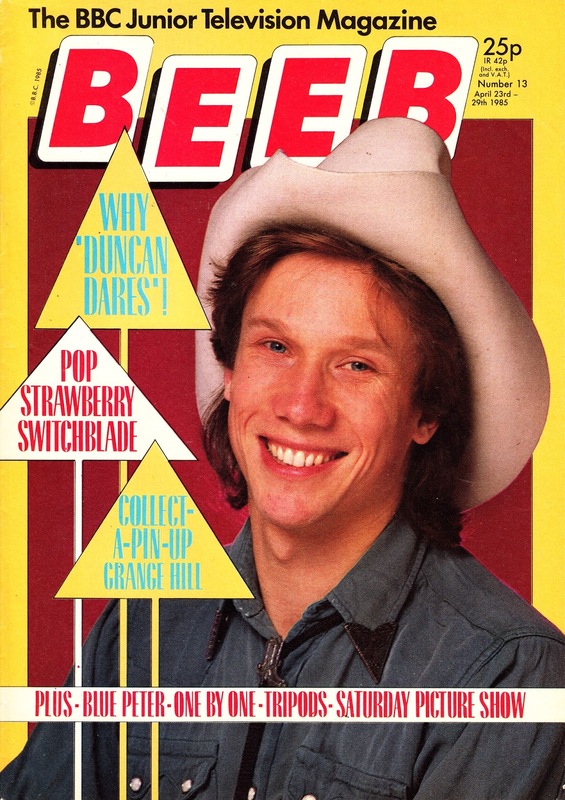 GRANGE HILL, late of IPC's standalone magazine and SCHOOL FUN, was a predictable choice. Gag strips were supplied by the TBE FAMILY NESS and, on loan from NUTTY, BANANAMAN. 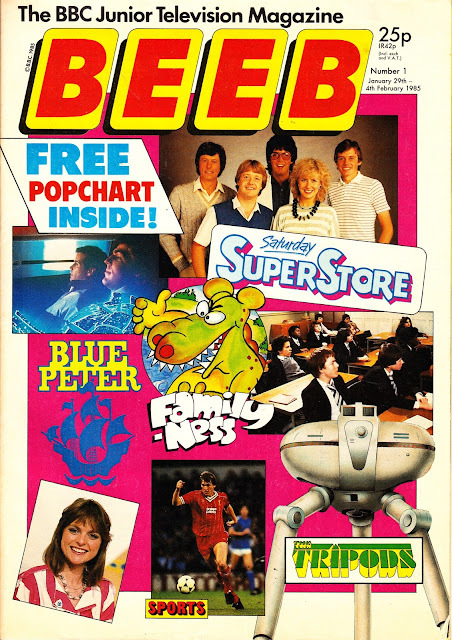 As the cover of the first issue suggests, the feature pages were populated by tie-ins with various other BBC shows including the reliable page-fillers BLUE PETER and SATURDAY SUPERSTORE. The masthead was rather cleverly in the style of the current BBC logo, although it was far from ubiquitous on-screen and in print compared with modern iterations. 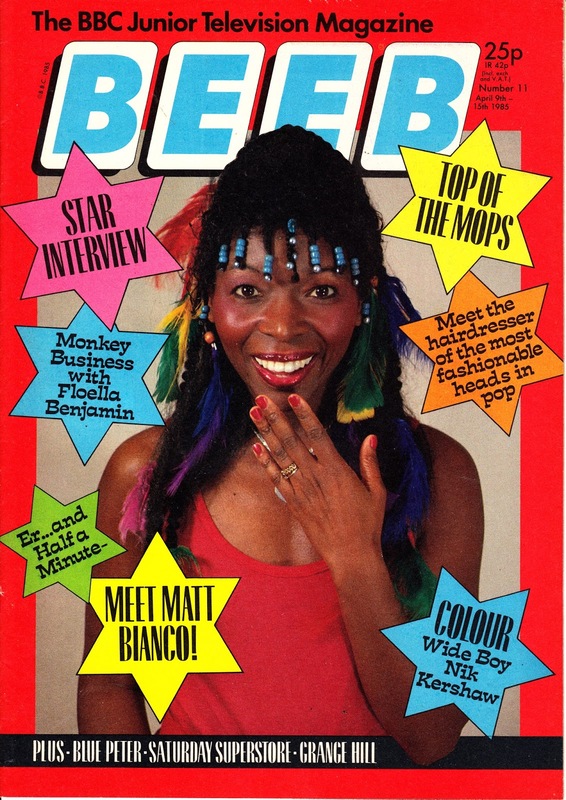 The Beeb name (derived from "Aunty Beeb") was revived during the BBC's early pioneering days on the internet when it was used for the Corporation's commercial website and online activities to keep them distinctly separate from the Public Service licensee-fee funded bits. That overlap and duplication was eventually streamlined away. 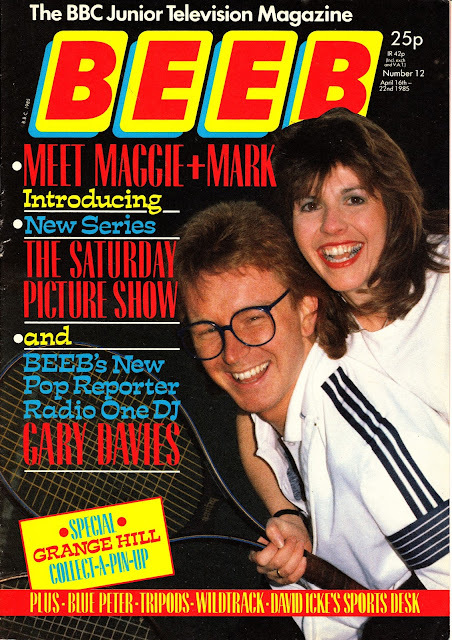 Because this wasn't an in-house BBC publication it didn't have automatically access to BBC airtime, an advantage thet LOOK-IN certainly enjoyed. That put it at a commercial disadvantage in the circulation wars. 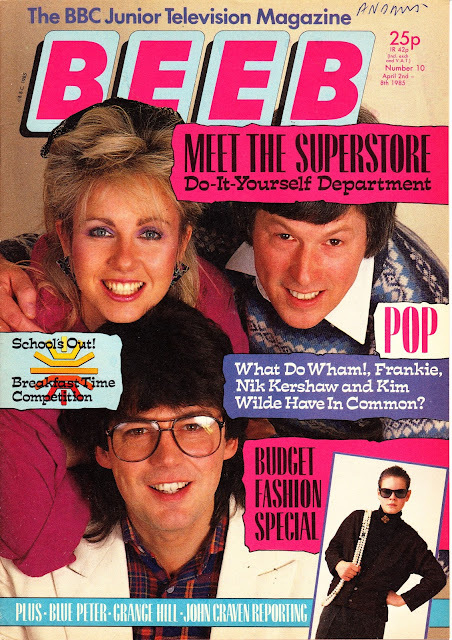 BBC Magazines didn't make the same mistake a few years later when it launched FAST FORWAD, a similar title that borrowed far more from SMASH HITS and the music magazines. That was given what must have amounted to thousands (even millions) of pounds of free airtime by running regular ads in the key 5.35pm junction sandwiched between the official end of CBBC ("except for viewers in Northern Ireland") and the start of the ratings juggernaut that was NEIGHBOURS at its prime. Copies of this title are surprisingly hard to find, perhaps reflecting the levels of reader indifference back in 1985. I recently came across a complete run... and snapped them up for STARLOGGED. From 1981: another, along with the annuals and the short-lived CINEMA MAGAZINE, of MARVEL UK's abortive attempts to grow the STARBURST brand beyond the core magazine. Visual Imagination managed, once it dropped into their hands, to use it as the basis for a whole publishing empire. Albeit one where quantity often seemed to trump quality. 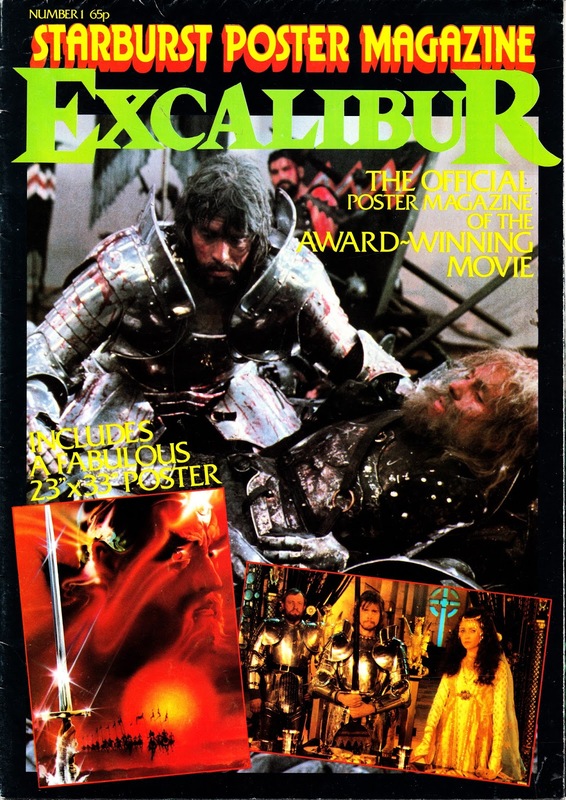 STARBURST POSTER MAGAZINE ISSUE 1 was devoted to the movie EXCALIBUR. Marvel obviously had a lot of faith that this one was going to have a bit of mainstream success as they also packaged up some US reprints as, rather cheekily, the MERLIN AND EXCALIBUR SPECIAL. I don't remember knowing anyone who went to see this at the cinema (or expressed any desire to do so) so I think Marvel's confidence was misplaced. The Starburst Poster Magazine did, however, continue. And we'll get to that. 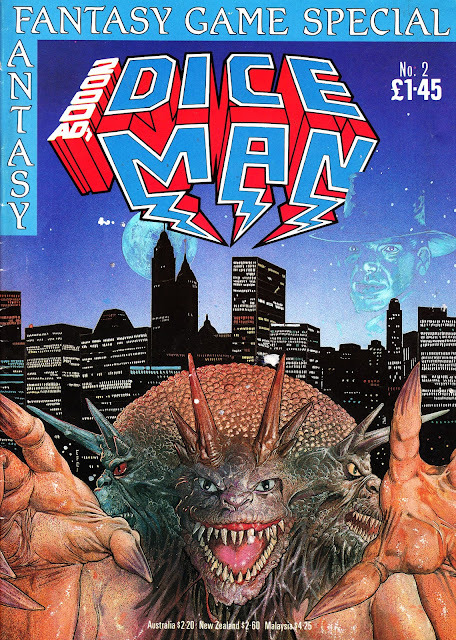 From 1986: the first of five issues (all of which I'll post in the upcoming days) of 2000AD's DICEMAN from IPC. 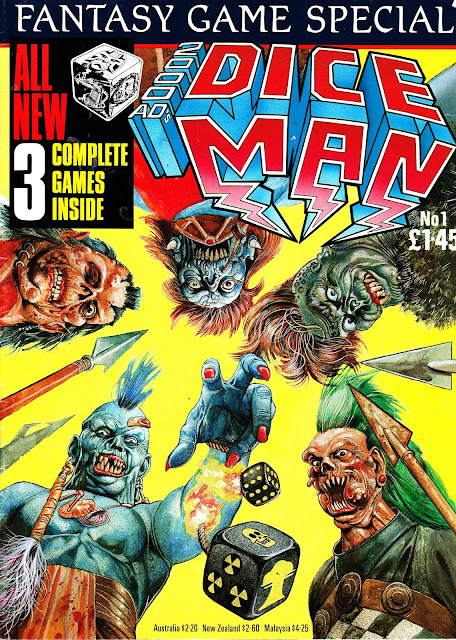 This was an attempt by comics innovator Pat Mills to fuse 2000AD's bankable roster of characters with the burgeoning worlds of Fighting Fantasy/ Choose Your Own Adventure and Role Playing Games. Creatively the concept worked (although it must have been a brain strainer to plot and plan everything) but some odd decisions hampered its chances of success. The cover price, compared with that of a normal weekly, was whopping and it bought you heavy paper stock and more pages but still didn't drag IPC into the age of colour interiors. Newsagents also seemed unsure ahst to do with these periodically published specials. It was a bit pricy for a comic which meant some didn't rack it in its natural home next to the weekly. Some placed it next to WARLOCK and the games/ hobbies mags... but Tharg's loyal and lapsed readers may not have thought to adjust their eye line to a different part of the display. And this cover is stunning... but doesn't do much to attract the Tharg followers. Maybe that was the idea. Maybe IPC figured the extensive advertising in the weeklies (which I've posted before) would ensure buy-in from that crowd and the more ambiguous design was intended to capture the attention of older would-be readers. Even so, I think Judge Dress or Slaine might have drummed up a bit more interest. 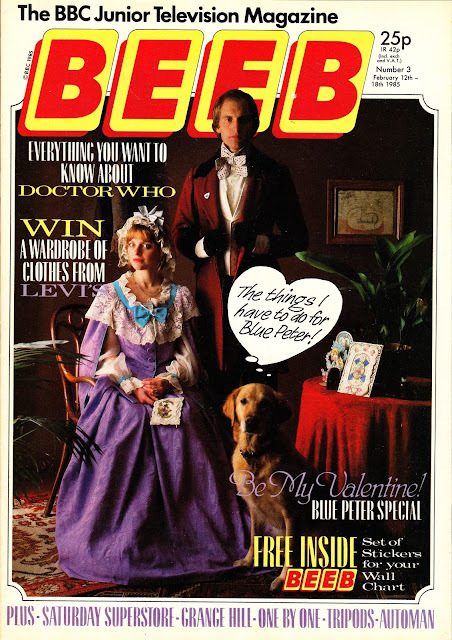 From June 1988: the next issue of DWB in my stack... issue 55. The Timelords came... and went. Gary Glitter went to PC World... Prison... and the Far East. And THAT movie still hasn't happened (although I saw the 50th anniversary special in the cinema opposite TVC... so that kinda counts). 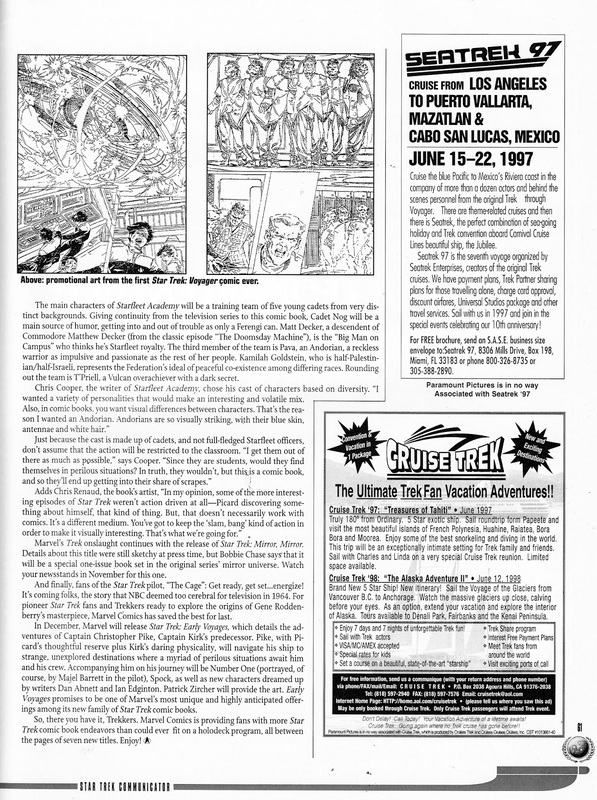 From August 1993: the 12th issue of the US comics fanzine/ prozine ARENA. This is, as far as I know, the only copy of this title that I have. Its one of the wave of new wannabes thet followed the debut of WIZARD. It's something of a missing link between the previous generation (AMAZING HEROES and COMICS INTERVIEW) and the newcomers. 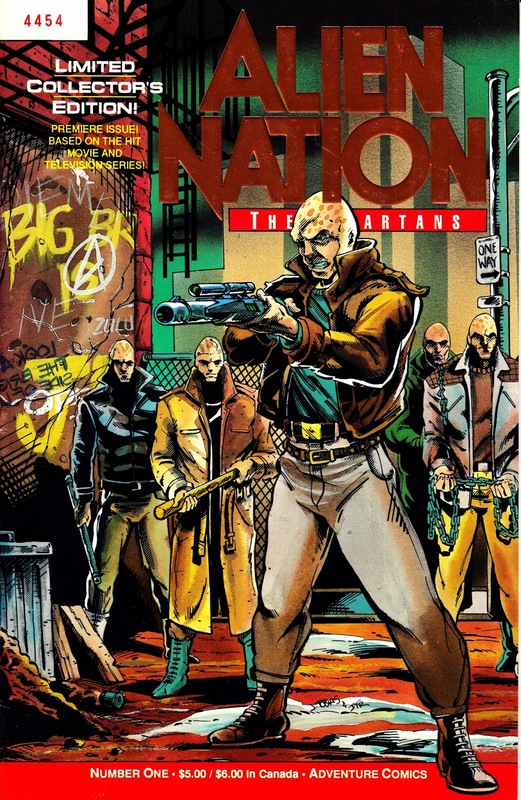 The dimensions are standard US comics sized and the interiors are black & white but the contents, as the cover suggests, embraced the new Dark Age and the initial Image boom. I don't remember this having much if an impact on me at the the time which suggests that copies were few and far between (the lack of back issues stuffing the 50p boxes tends to support this), the price was too high or the contents simply not much cop. I wasn't an image fan so possibly the latter if this issue is anything to go by. 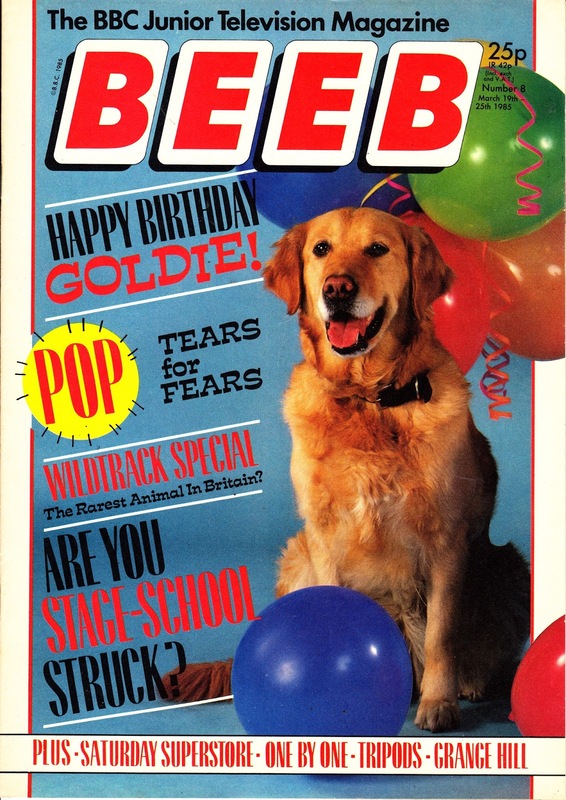 A total of 17 regular issues and a year-in-review special (1994) apparently appeared. From September 1991: the second issue of the (unofficial) UK STAR WARS FAN CLUB magazine. It also notes thet the initial forty strong membership had already doubled to nigh on eighty. I don't know if that's a good indicator of how many copies of this were first published or whether they over-printed to have plenty in reserve when the membership grew. The format is A4 with colour cover and black & white interiors and probably produced on a high-end (for the time) printer or copier. The contents are uniformly good with the two highlights being an extended look at the deleted scenes of A New Hope (which I remember coming as something of a revelation back in the day) and a look back to the initial release of The Empire Strikes Back (originally intended to celebrate the 10th anniversary but pushed back and back as the publication date did likewise). The former pulled together the hints of missing material from scripts, Topps gum cards, the novelization and the Marvel adaptation. There was also a review of the new Zahn novel HEIR TO THE EMPIRE (which was taken to task for incorporating elements from West End Games) and a piece on the most recent widescreen (!) VHS releases of the original trilogy. Plus news, correspondence, plugs for other clubs and fanzines and the like. It's a lovely return to the halcyon days where the saga was a far far more simple place as well as being far far away. 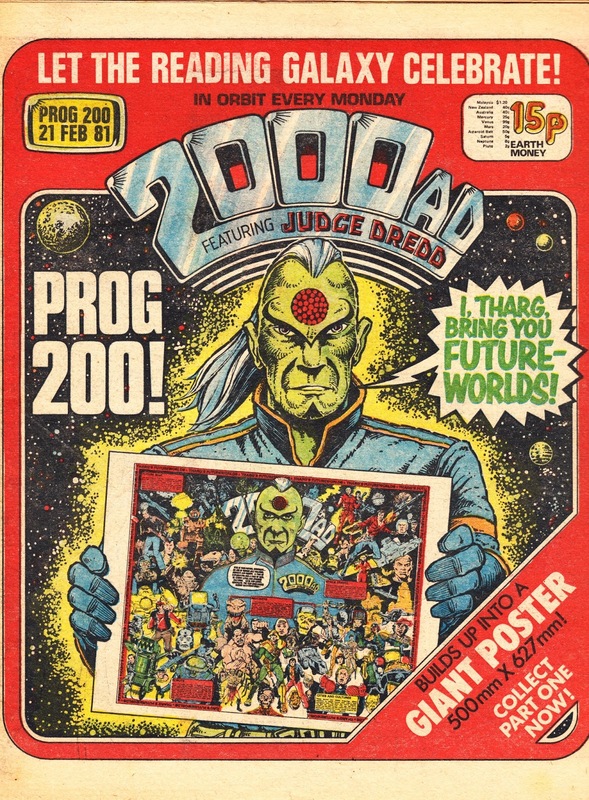 From February 1981 (again): 2000AD celebrates reaching its 200th issue - ahem - prog. The official organ of the Mighty One is about to celebrate its 2000th issue (who would have imagined?) but I've posted this today to mark STARLOGGED's 2000th post. Yes. Really. I noticed a couple of months ago that I was approaching the unexpected landmark and I thought this was as good a cover as any to hold back for the big one. I never thought STARLOGGED would chug on past the first dozen or so posts so this whopping figure is a revelation to me as well. It also means that I have posted well over 2000 different items on here, which is a sobering thought as 95% of things come from my own collection. No wonder I have no space, no money and a frustrated flatmate. Last week I took one of Starlogged's periodic rest weeks but I used the time constructively (so say I) to dive deep into some previously uncharted boxes to scan some more goodies. I also travelled a little further than usual (not far) and used the opportunity to tawl some outlets I don't usually get a chance to visit and picked up a few bargains (RED DRAWF smegazines for 25p each for example) that will also pop up here in the months ahead. Thanks to everyone who stops by regularly (go spread the word) and especially thanks to everyone who comments occasionally or regularly. If you are a relative newcomer, don't be afraid to dive into the Starlogged back catalogue that dates back to 2012 (those early posts were written at Cafe Nero, a relative stone's throw from the banks of the Thames and the one-time HQ of MARVEL UK) and see what you discover. 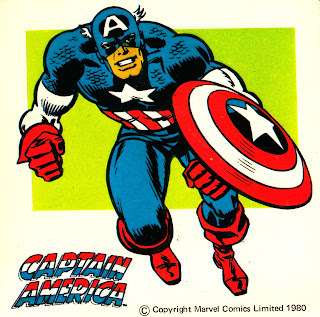 From February 1981: The first issue, and loosely inserted (all but guaranteed to fall out in the newsagents long before anyone had the chance to buy a copy) free sticker, of MARVEL UK's CAPTAIN AMERICA weekly. I've cover the bulk of this run in posts long past but I had a few gaps in my collection, including this launch issue. I'd actually forgotten that I'd subsequently acquired a copy and was quite pleased to discover it whilst rummaging. I planned to post this yesterday for the 4th of July holidays but - typically - the Wi-Fi stopped working so the plan was delayed by 24-hours. Better late than never. 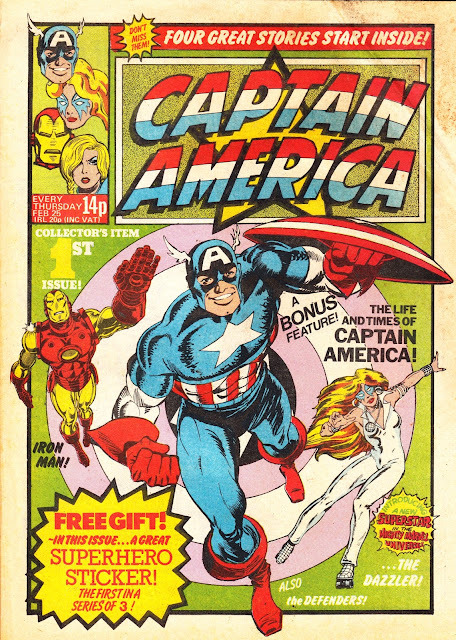 CA wasn't an obvious choice for a British weekly back in 1981 (it would be a no-brainer today) but Marvel did their best to make it a success by abandoning their normal policy of running dusty reprints (or reprints or reprints by this point) in favour of a more contemporary line-up. Including the UK debut of the DAZZLER strip. The other two strips were Iron Man and - ported across from the RAMPAGE - the Defenders.